Bohemian Style Long Duster Coat and Skirt Set ln a natural color is perfect for any occasion. Full of details starting from the bell ruffled sleeves to the delicate lace trim inserts makes this Bohemian Style Long Duster Coat and Skirt Set is perfect for a romantic wedding or just a semi-formal western event . 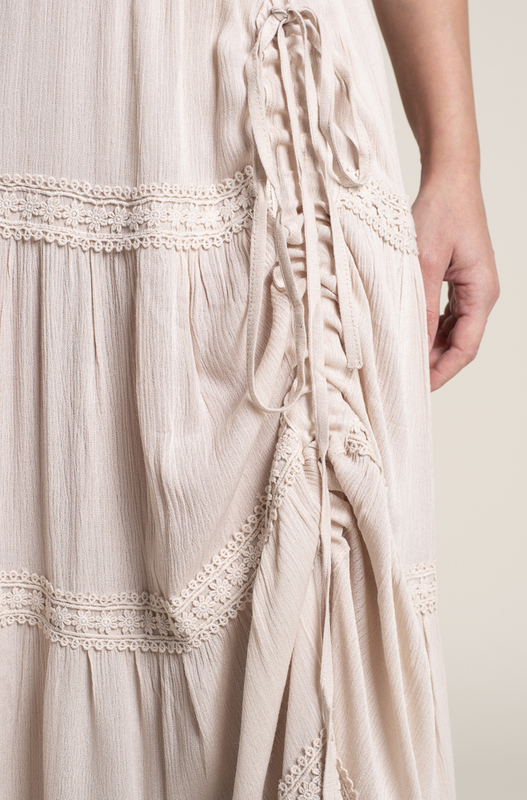 The skirt can be worn in two ways for a more Bohemian look the two strings can be pulled so the skirt will have a high low effect or just wear it as a ruffled skirt. Elastic waist makes it a very comfortable skirt to wear. Perfect outfit to be accessorized with your favorite jewelry. The Model is a size 6 and is 5’7” tall wearing size small. Relaxed Fit, 100% Rayon. Made in USA.